Texas and Nebraska retain their status as top performers in Site Selection’s annual facilities race. What worked for Texas and Nebraska in 2016, and in previous years, worked just as well for them in 2017. Both states have successfully defended their claim to the Governor’s Cup they won last year — for total projects per capita in Nebraska’s case and for total qualified projects in Texas’. Both states’ investment attraction success in 2017 was impressive. Nebraska increased its project count from 101 to 110; Texas dropped from 642 in 2017 to 594 in 2017 but still finished well in front of runner-up Ohio’s 467. 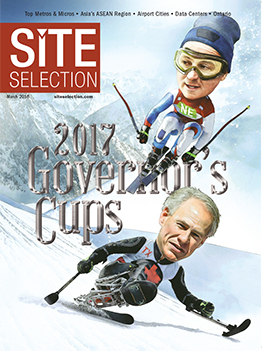 This makes the fourth consecutive Governor’s Cup for Texas Governor Greg Abbott and the state’s sixth consecutive Cup. It’s the second Cup for per capita activity for Nebraska Gov. Pete Ricketts, and the state’s third. Familiar faces round out the top five in each Governor’s Cup race: In total projects, following Ohio’s latest second place finish, Illinois is third with 419 projects, Georgia is fourth with 281 and North Carolina is fifth with 274. On the per capita side, this year’s results are not unlike last year’s. Ohio and Kentucky swapped places, with the Bluegrass State claiming second place with 248 projects followed by Ohio (467), Illinois (419) and Georgia. Despite their vast difference in population, Texas with approximately 28 million residents and Nebraska with under 2 million have more than longitude on the globe in common. They are both leading locations for wind energy a factor behind recent investments in both states from Facebook. The social networking technology giant insists on its data centers being run by renewable energy — a capability not every state can deliver. You’ll find an emerging Fintech industry in both states. Texas’ is further along but look closely and you’ll find players in the Omaha region, too. They know they don’t have to live in New York, Chicago or Silicon Valley to contribute to and capitalize on this sector. They also share strong business climates, plenty of room for ranches and thriving agriculture and food processing industries. But ask Governors Abbott and Ricketts why they think their states won Site Selection’s facilities race again in 2017, and they both point first to their workforce. Gov. Abbott frames his workforce remarks in an interview with Site Selection Editor Mark Arend in the context of Amazon’s HQ2 contest, a fight in which Texas has two contenders — Austin and the Dallas-Fort Worth metroplex. Amazon operates seven fulfillment centers and three sortation centers in Texas. The governor says Texans’ knack for overcoming obstacles big or small is another quality executives mention when discussing the state’s labor pool. That quality was stress-tested in spades when Hurricane Harvey roared onshore northeast of Corpus Christi in August 2017 as a category 4 storm. It would devastate Houston, Harris County and other locations with massive flooding and wind damage, causing an estimated $125 billion in damage. Gov. Abbott says the rebuilding process has been “robust and prolific” and that different regions of Texas were affected in different ways. Texas has received over $20 billion in recovery funding from Congress and was awaiting word at press time on another $20 billion that would be used for flood mitigation projects. “Smart investors have realized this is an opportunity to go into places like Houston and invest,” says Abbott. “Whether it’s investors looking for homes to buy or businesses looking for buildings or real estate, this actually provides an opportunity to invest in areas. We’re seeing private-sector dollars beginning to flow in. Economic development programs, such as the Texas Enterprise Fund — the state’s deal closing fund —are fully funded for the foreseeable future, but the governor cannot report progress on financial measures he has been championing for some time. “In my first legislative session we cut the business margins franchise tax by 25 percent, and we cut property taxes by over $1 billion dollars,” he relates. “We had a bold property tax reduction proposal during the recent legislative session that did not pass. But the highest demand by our constituents for tax reform in Texas right now is property tax reform. Interestingly, it’s a plan that 15 other states have already adopted in a similar form, which is a 2.5-percent property tax revenue growth cap to limit the growth of property taxes so that people can stay in their homes and contain the cost of living. “We were unable to reduce the business franchise tax further,” he says, “but it’s still part of our plan to continue chipping away at the margins tax until it is eliminated. Gov. Abbott says the program is attracting to Texas some of the premier researchers in the country. Texas added nearly 307,000 new jobs in 2017, even with Harvey bringing business to a standstill in parts of the state for days and weeks on end. But that’s not the only highlight of the past year, says Gov. Abbott. “Even in a year with one of the biggest disaster challenges, Texas was a hotbed for new job growth. Unemployment lowered to the lowest on record and didn’t slow us down from remaining the top exporting state in the nation. The energy sector is expanding dramatically given the magnitude of what’s going on in the Permian Basin and surrounding areas. That’s leading to more oil and gas exploration and production but also a gigantic increase in shipment outside Texas. What does the governor have in store for 2018? Governor Pete Ricketts is a huge believer in his state’s workforce, part of which comes from his background as a major Nebraska employer — he was chief operating officer of TD Ameritrade. Ground broke on Costco’s poultry processing plant in Fremont in June 2017. Projected to open in April 2019, the $300-million project is expected to generate an overall economic impact of $1.2 billion annually, create approximately 800 new jobs, and connect Costco to a dedicated network of producers in eastern Nebraska. Can Nebraska deliver the fiscal soundness and predictability that capital investors look for? People equate cutting budgets to cutting services, Gov. Ricketts says, but it’s not always true. Will Tax Relief Happen in 2018? Another issue the governor is working on is the valuation of agricultural land, of which there is no shortage in Nebraska. The governor recalls a recent hearing where a farmer had done the math and testified that if the legislature were to pass this bill he would be able to provide stability to his property taxes over the course of the next 14 years. “We also have a piece on reducing our income tax rates, lining up our corporate tax rate and our individual tax rate and bringing them down from their current levels — corporate is 7.81 percent and individual is 6.84 percent — and working in two steps to bring them down to 6.69 percent. It’s not the most dramatic change, but progress is being made, and we’re managing it within our budget. “The third part of our tax bill has to do with workforce development and making additional investments there to make sure we have the right trained, skilled workforce here in our state,” says Ricketts. Nebraska has strong ties to foreign markets, which Governor Ricketts intends to build on. This is particularly important, he says, as the specter of NAFTA renegotiations looms. While in Canada, the governor prevailed on a plastics company there to consider Nebraska as it mulled a US expansion. In October, Ontario-based Agri-Plastics announced plans to invest in Sidney with a facility that will enhance production efforts at Agri-Plastics’ two full-capacity plants in Canada. Established in 1995, the company manufactures calf hutches and plastic products to support North America’s dairy industry. Agri-Plastics plans to hire more than 20 employees in the Sidney location for manufacturing and production jobs. Kawasaki’s first aerospace operation in the US is in Lincoln, notes the governor, where cargo doors are being built for Boeing’s 777X cargo aircraft. Railcars are also built at the facility. And Nebraska beef is now being exported to China for the first time in more than a dozen years. On the technology side of the state’s industrial base, Nebraska is welcoming a major Facebook project in Sarpy County, near Omaha. Can Nebraska differentiate itself from neighboring states — or those farther afield — and secure a third consecutive Governor’s Cup? That’s the plan, says Ricketts.